Barcelona's win ensured they go to the winter break with a three-point lead over second-placed Atletico Madrid. Lionel Messi ensured Barcelona reached La Liga's winter break atop the standings, playing a part in both goals of a 2-0 win at home over Celta Vigo on Saturday. Messi scored Barcelona's second goal to take his league-leading tally to 15 in 17 rounds, including six goals in his last three matches, as Barcelona stayed three points ahead of Atletico Madrid. "Our goal was to finish the year as leaders, and with the same advantage we had going into the round," Barcelona coach Ernesto Valverde said. 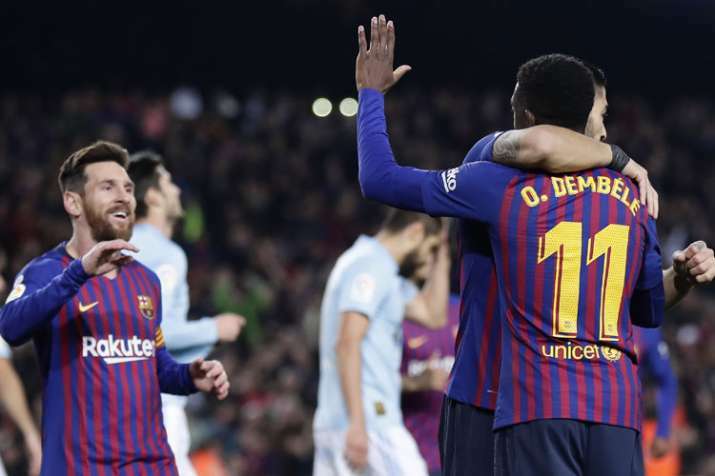 Messi helped to set up Ousmane Dembele's opener when he received a pass from Jordi Alba and took a shot that was saved by goalkeeper Ruben Blanco. The rebound fell to Dembele to drive between the legs of a defender to take the 10th-minute lead. Messi made it 2-0 in the 45th after Jordi Alba found him arriving to the center of Celta's box completely unmarked to fire in a left-footed shot. "On the first goal I looked for (Messi) like always, and on the second goal Luis (Suarez) and Dembele made runs to pull away defenders and left Leo alone," Alba said about his role in both goals. "And Leo never misses." Third-placed Sevilla trails Barcelona by six points before visiting Leganes on Sunday. After Sunday's games the Spanish league stops play for two weeks. Celta lost top scorer Iago Aspas -- fourth in La Liga with 10 goals -- to a leg injury early in the second half. The Spain striker walked gingerly off the pitch to the applause of the Camp Nou crowd, which included former Barcelona star Andres Iniesta. Celta said Aspas hurt a muscle in his right thigh and expects him to be sidelined for a month. "Iago is for us like Messi is for Barca," Celta defender Hugo Mallo said. "Any injury (to a teammate) hurts us, but an injury to Iago hurts even more." A goal worth three points! Antoine Griezmann scored a second-half penalty to help Atletico eke out a 1-0 win at home over Espanyol, keeping the team coached by Diego Simeone right behind defending champion Barcelona. Espanyol started well as Borja Iglesias drew two saves from goalkeeper Jan Oblak before Leo Baptistao hit the post in the first half hour. But Atletico tightened up its defense and got the goal it needed from Griezmann. Griezmann drove in a rising shot from the penalty spot in the 56th after Jorge "Koke" Resurreccion was fouled by Esteban Granero in the area. Espanyol, which had risen to the upper part of the table earlier in the season, fell into 12th place after a sixth consecutive loss. With its game from this round postponed so it could play the Club World Cup, Real Madrid successfully defended its world title by beating Al Ain 4-1 in Abu Dhabi on Saturday. Barcelona's win left fourth-placed Madrid eight points back with a game in hand that it will recover on Jan. 3 when it cuts its vacation short to visit Villarreal. Eibar also earned a 1-1 draw at Real Betis after Fabian Orellana converted a second-half penalty.